Attending one of our IOSH Managing Safely courses is a must for every manager and supervisor. These superb face-to-face IOSH health and safety training courses are the most effective way to ensure that responsibilities are fully understood. Our IOSH Approved courses provide practical, step-by-step guidance that’s hands-on and jargon-free. The innovative format and engaging content inspire and motivate delegates, embedding safety and health across your organisation. The course fee includes all tuition, course materials, ongoing expert support, assessment, certification, lunch and refreshments. 100% of Anchor Hanover training delegates said they would recommend our IOSH approved course to their colleagues. Who should attend the IOSH Managing Safely course – and what will you learn? What makes our training courses the best? Quality, face to face learning – more effective than online courses. 3 days duration: time to fully absorb learning, maximising pass rates. Access to expert support ensures success: get the practical guidance you need. We are an established, IOSH approved training provider. What are our IOSH Managing Safely courses like? Practical, including hands-on assessments and real-world scenarios. Personal: face-to-face training engages and motivates. 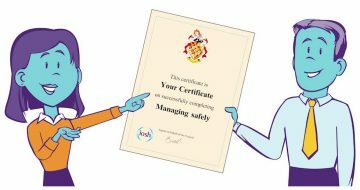 Well supported: we also run the IOSH Managing Safely Refresher course so managers who have successfully completed a Managing Safely courses can update their knowledge when required. Attending our IOSH health and safety training courses equips managers to introduce practical controls to improve health and safety. Provide managers with internationally recognised certification. Our IOSH Managing Safely courses are held in a state-of-the-art training room at our Central London HQ. Conveniently located just minutes from Kings Cross station, the surroundings and facilities help create a fantastic learning environment. Find out more about our IOSH Managing Safely Refresher and IOSH Working Safely courses. We can also provide in-house health and safety training courses that are customised to use your own systems, policies and procedures – contact us to discuss your requirements.